Maybe Flight 370 Was Brought Down by Chinese Solar Power? Well not seriously, but just about every other theory, including aliens and the Koch brothers, have been floated. Well, okay, I’m the only one (I think) to say the Koch brothers did it, and that was simply to bait MSNBC; is there any doubt that someone in the fever swamps of the Left—Dan Rather perhaps?—might believe it? Pilots flying both private and commercial aircraft near Las Vegas have filed complaints abut possible unsafe conditions caused by a large solar power plant in the Mojave Desert, according to documents filed with a state agency, and Las Vegas officials are urging the plant’s designer to do something about the problem. 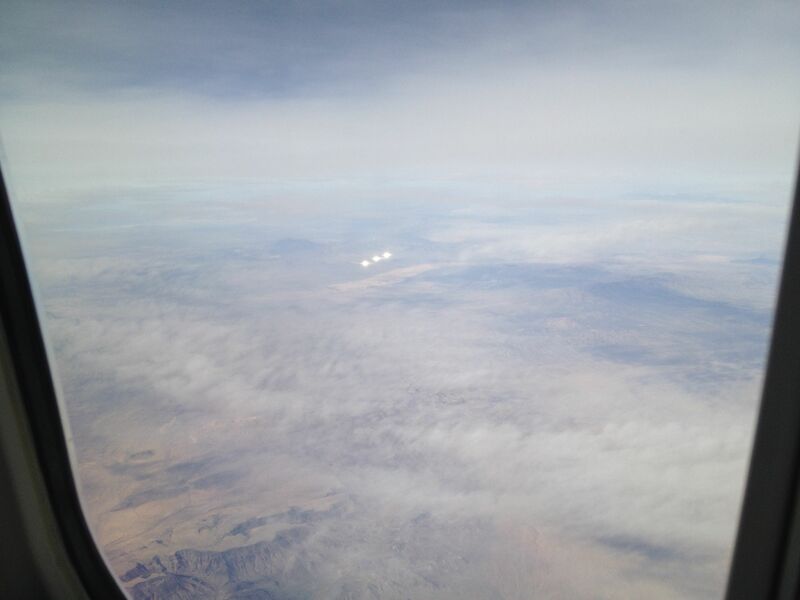 According to a March 10 letter from the Las Vegas McCarran Airport’s Planning Manager Teresa Motley, pilot complaints of unsafe glare from the tens of thousands of billboard-sized mirrors at the Ivanpah Solar Electric Generating System (ISEGS) have been coming in since at least August 2013, with at least one pilot saying the glare from the facility interfered with the crew’s ability to scan the sky for nearby aircraft. Here’s the photo I posted of the beast during a United flight from Denver to Los Angeles, from at least 50 miles away. You can imagine how much brighter this would loom for airplanes descending into McCarran Airport in Las Vegas. Meanwhile, Andy Pazstor, the Wall Street Journal reporter who broke the story John referenced this morning, is standing by his story that the plane few on for several hours and transmitted engine data to Rolls Royce. He is interviewed by Boston NPR affiliate WBUR and you can listen to it or read the transcript here. The very first blog post I ever wrote, back on the late great NoLeftTurns site in 2002, was about the DC sniper episode. People ran away with theories that the snipers were Arab terrorists, and while the main bad guy did turn out to be named Muhammad, he was, as I suggested in my speculation, a home-grown nut rather than an Al Qaida operative. My instincts say the same thing about Flight 370. This Stanford student thinks a previously noted structural problem in 777s is going to turn out to be the culprit. This reminds me of both space shuttle disasters, where we had a good idea fairly soon what structural problem would turn out to be the cause.